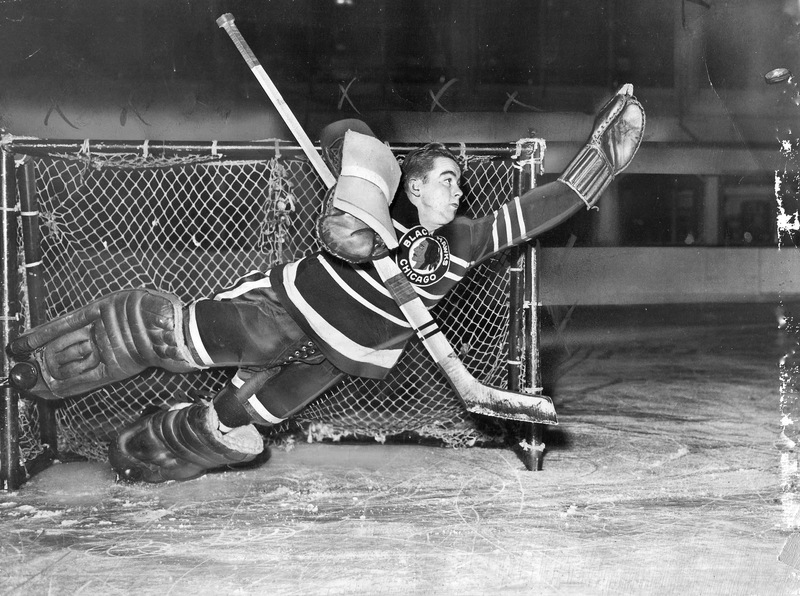 It’s said that Frank Brimsek hated having his photograph taken for fear that the flash would harm his eyes and thereby his puckstopping prowess. I don’t know how true that is — he does seem to have posed unblinkingly for a whole lot of (very handsome) portraits during his NHL career, in several classic poses, including the Standing Tall and the Pucks Have Been Known To Feint Dead Away, Facing My Icy Glare. Those aren’t the only ones available to the goaltender facing a photographer, of course. Roy Worters perfected the Ennui I’m Projecting Oughta Stop At Least A Few. And as Emile Francis demonstrates here, in 1947, there’s also the No Way That Puck Is Going To Dip Down Under The Crossbar, But Oh Well, Best Maybe To Fling Myself Across The Net Just In Case. Now 91, Francis is maybe best remembered now as a long-time and even legendary coach and general manger of the New York Rangers, but his career as a guardian of NHL nets lasted six years before that. 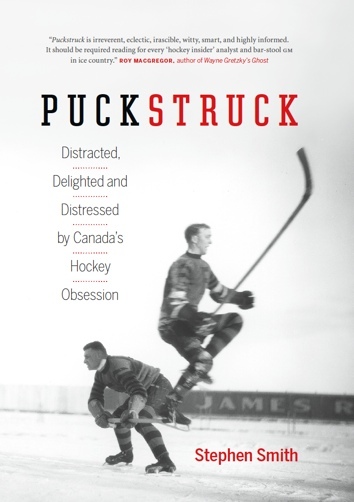 Brimsek and Chicago’s Mike Karakas are generally credited with introducing a pocketed catching-glove to the goaltender’s armour in the late 1930s, but it was Francis who adapted a first-baseman’s mitt into what we recognize today as the goaltender’s trapper. In Francis’ first season as a Black Hawk, Detroit coach Jack Adams tried to have the glove banned as oversized and therefore illegal. He wasn’t successful, and after NHL president Clarence Campbell took a look and deemed it permissible, the Francis trapper became standard gear in NHL creases. The man they called the Cat would play two seasons in Chicago Black Hawks before a trade took him to the Rangers, where he served mostly as a back-up to Chuck Rayner. That’s a chubby looking Francis…but hey, when you’re flinging yourself across a goal crease, the gravitational forces may reek havoc on one’s visage.